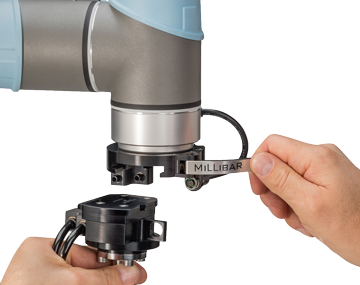 Redeploy any UR robot to a different task in just seconds using the Millibar manual tool changer. End-of-Arm-Tool changes are very easy to perform with this tool that weighs 13 ounces and is about 3/4" tall. Two models are available, one is a basic manual tool changer, while the other passes air and power utilities from robot to end-effector. The applications for which this is ideally suited include, Pick and Place, Injection Molding, Packaging and Palletizing, Product Assembly, CNC Machine Tending, and Lab Analysis and Testing. HTE Automation and Millibar provide end-of-robot-arm tooling solutions to manua=facturers in Kansas, Missouri, and Illinois.